Sr. Mary Martin Nelson, age 97, died on August 28. 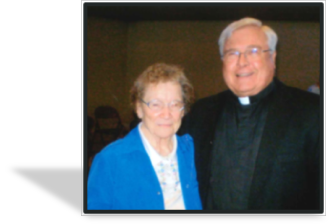 She served at St. Patrick’s as Religious Education Coordinator for K-6 Grades from 1976—1986 during the era of Fr. Jack Donahue. Visitation and Welcome Prayers starting at 10:00 a.m. Lunch in Carondelet Center Diving Room. 1:00 p.m. Procession and Prayer at Resurrection Cemetery.